One of my first assignments at AWS was as part of a team that wrote our upcoming class on welding symbols, Understanding Welding Symbols. When I first opened AWS 2.4 Standard Symbols for Welding, Brazing, and Nondestructive Examination, my eyes glazed over and I thought to myself, how on earth do I make this accessible to our end users? Like other technical documents of its kind, AWS 2.4 is written as a set of rules and organized like a reference manual. The document is technical and concise, and serves its purpose: to present a system for indicating welding, brazing and nondestructive examination requirements. However, AWS 2.4 is not meant to be read like a book and the material needs a bit of explaining if you have never been exposed to it. That’s where we come in. We researched and reached out to subject matter experts to help us make the material more user-friendly. The result is our upcoming class, Understanding Welding Symbols. While doing the research and writing, we noticed a few areas that can be a bit tricky and can easily cause confusion. If you haven’t brushed up on your welding symbols rules in a while, here are five common mistakes that you can avoid. A back weld and a backing weld are not the same thing…although both use the same welding symbol. A backing weld goes on before the actual groove weld. Think of a backing weld as the support for the real weld. A back weld goes on after the fact…to pretty up the weld if you will. If a weld covers the entire perimeter of a joint, the weld-all-around supplementary weld symbol is used instead of inches. The weld-all-around symbol indicates that the weld continues completely around the perimeter of the joint. As a reference, take a look at Figure 8 of AWS A2.4:2012, Standard Symbols for Welding, Brazing, and Nondestructive Examinations. Now, circumferential joints, such as those formed by a pipe or rod, are excluded from this requirement. If no length dimension is given, it is assumed that the weld encompasses the entire perimeter of the joint. Because of this, the weld-all-around symbol is not needed. Take a look at the images below. 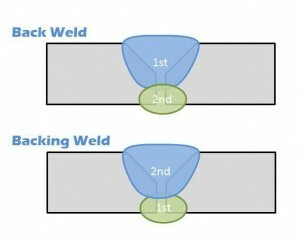 The first image depicts a fillet weld that covers the full perimeter of a joint. The weld continues along every edge of the joint. Because the weld covers the joint entirely and follows all changes in the direction of welding, the weld-all-around symbol is used. The second image is of a seal joint around a pipe. Since no length dimension is indicated, we know that the weld covers the entire circumference of the part, negating the need for a weld-all-around symbol. Sometimes on non-destructive testing symbols, we see a percent value next to the letter designation of the test. For example, MT 50%. At first, I thought this meant magnetic particle testing at 50% intensity…but it actually means magnetic particle testing on only 50% of the piece. 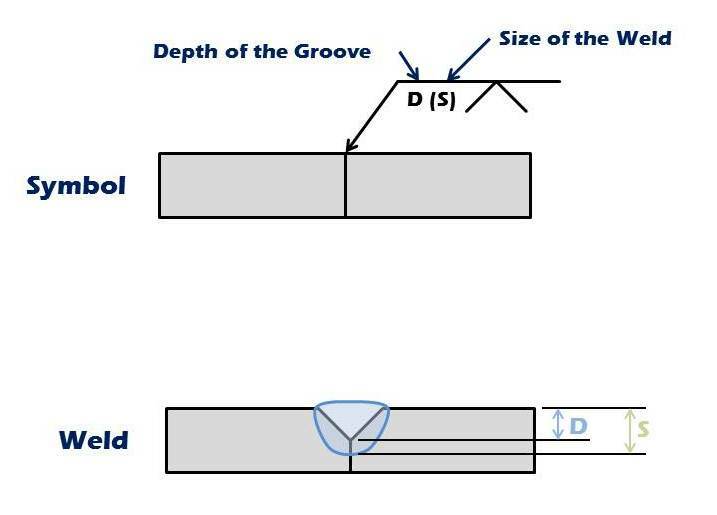 This one is a very common mistake: the depth and size of a groove weld are NOT the same thing: Depth is the depth of the groove, before any welding takes place. This measurement is use to prepare the joint for welding. Size is the size of the weld itself measured during and after the welding takes place. A break in the arrow of a welding symbol points to the member that has a bevel. 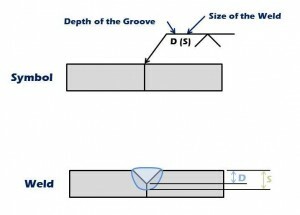 However, if it is obvious which member or members are beveled, such as a V groove on one side of the joint, the break in the arrow is not needed. Stay tuned for five more common welding symbols mistakes coming up in our next blog post. If you didn’t know this already you shouldnt be welding. CP is not a standard AWS notation but I suspect it is probably a shorthand version of CJP (complete joint penetration). Thanks, a review is just like a safety meeting. It needs to be talked about and talked about often. Safety meetings: irrelevant people incessantly talking about how to do stuff they will never do safely…? A good reference to demystify the welding symbol! Didn´t understood very well the “Mistake 2”. Your saiyng that if i´m welding a pipe to a plate, the symbol is not that one?! It´s only for strait welds!? Can´t it be on a continuos weld all around? It has change directions!? If you are welding a circular object, like a pipe, you do not need a weld all around symbol because it is one continuous weld. 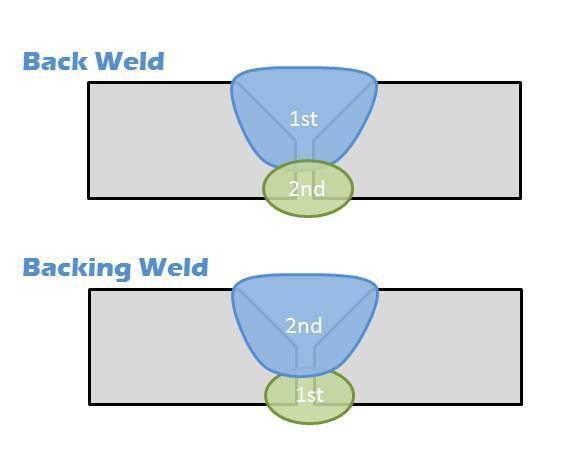 If a change in direction 8is required, then a second welding symbol must be used and dimension lines are needed to define the different welds. What defines a change in direction? It is always good keep studying weld symbols. Yes! are common mistakes, thank you! I want to mechanical testing book for welding. Very helpful. Now I know the difference between back weld and backing weld. The mistake # 2 is a new to me. I didn’t know that is wrong use the weld-all-around symbol on circular components. I am not clear for mistake 3, can you show detail up?! Very imp. Information. Next year when I will come to india, I will attend AWS exam. Regarding mistake #2, I’ve been told that it depends on the drawing view where the weld symbol is applied, i.e. if in the view which contains the weld it is unclear that the feature is circular then the all-around symbol shall be there. Is that correct? Thank you for your comment! You’re right! If a weld covers the entire perimeter of the hole, the weld-all-around supplementary weld symbol is definitely used instead of a degree or inches. The weld-all-around symbol indicates that the weld continues completely around the perimeter of the joint, even for circular joint members. As a reference you can always take a look at figure 34A of AWS A2.4:2012, Standard Symbols for Welding, Brazing, and Nondestructive Examinations. Now, if this weld was intermittent, the weld-all-around symbol is not used. Instead, hatching or dimension lines would be used in order to depict the location and length of each weld bead. Thanks again for commenting! We will edit the entry by going over the rules surrounding the weld-all-around symbol in more detail.